ليبيا هي دولة عربية تقع في شمال أفريقيا على الساحل الجنوبي للبحر الأبيض المتوسط. يحدها من الشرق مصر، من الجنوب الشرقي السودان، من الجنوب تشاد و النيجر، من الغرب الجزائر و من الشمال الغربي تونس. عدد سكان ليبيا ضئيل مقارنة مع مساحة البلاد، حيث تعد السادسة عشرة على مستوى العالم من حيث المساحة، كما أنها تملك أعرض ساحل من بين الدول المطلة على البحر المتوسط، يبلغ طوله حوالي 2000 كم. Libya is a country in North Africa. Bordering the Mediterranean Sea to the north, Libya lies between ► Egypt to the east, ► Sudan to the southeast, ► Chad and ► Niger to the south, and ► Algeria and ► Tunisia to the west. With an area of almost 1.8 million square kilometres (700,000 sq mi), 90% of which is desert, Libya is the fourth largest country in Africa by area, and the 17th largest in the world. The capital, Tripoli, is home to 1.7 million of Libya's 5.7 million people. 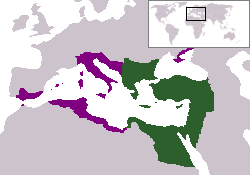 The three traditional parts of the country are Tripolitania, the Fezzan and Cyrenaica. 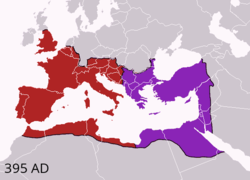 Other languages Italian: Libia a o semplicemente Libia, è uno Stato del Nordafrica confinante con il Mar Mediterraneo e compreso tra l'Egitto ad est, il Sudan a sudest, il Ciad e il Niger a sud e l'Algeria e la Tunisia ad ovest. La sua capitale è Tripoli. More images Libya - Libya (Category). 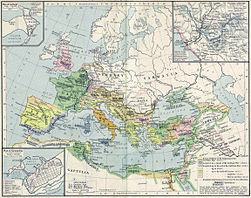 This section holds a short summary of the history of the area of present-day Libya, illustrated with maps, including historical maps of former countries and empires that included present-day Libya. ↑ Romanization: al-Lībiyya - Lībyā.